Let’s directly start with an example of the requirement to change the fiscal year. Suppose the fiscal calendar runs from January till December and this needs to be changed. The new calendar will run from April till March. You might have already posted transactions in your environment for several years. Also you could have some other companies which also needs to get a new pattern. Due to different regulations per country it might become a bit more complex. Some companies then would need to have the current fiscal year extended to 15 months. Other companies must have the current year to be 12 months and the next year 15 months. Also others might be in the need for an additional fiscal year of three months. Whatever the regulation is, the best thing to do is per different shift you need to create a new fiscal calendar. Ax example the USMF demonstration company will be used. This company has now transactions in the fiscal year 2015 and also new fiscal years for 2016 and 2017 are already created. Use the navigation path General ledger > Setup > Fiscal calendars. 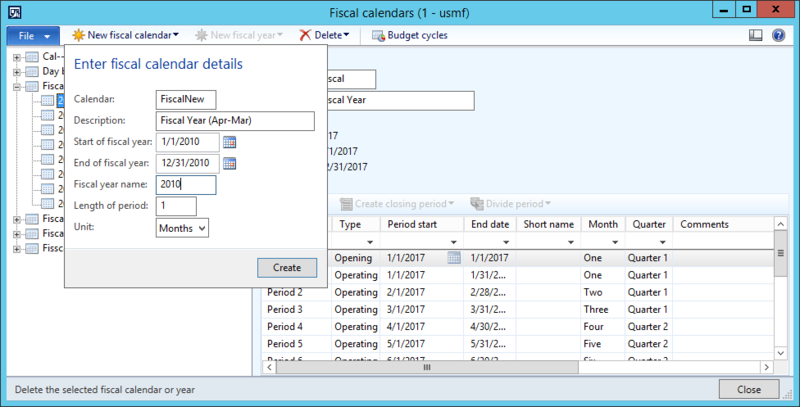 You can click the button New fiscal calendar to create a new shared calendar with the old years, a shifted year and new book years starting each year in April. Fill the fields on the drop down dialog with the values for the first year with the original start and end dates for the fiscal year and click Create. You now have created a new calendar with the first fiscal year. You need to add more years to this calendar. Click the button New fiscal year. Check the fields. You can also select the field Copy from last fiscal year to have an identical copy of the year 201o. Then click Create. Repeat the procedure of creating new fiscal years until you come across the first year which will be different. Untick the field Copy from last fiscal year if this was enabled and change the field End of fiscal year to indicate the new end date. Note that this will result in some periods at the end of the year with the same Month and Quarter values. Eventually you can change this. You can now create more fiscal years starting from April 1 and ending March 31. 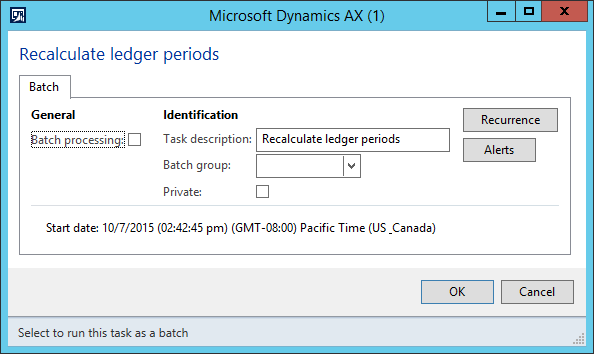 Click General ledger > Setup > Ledger. 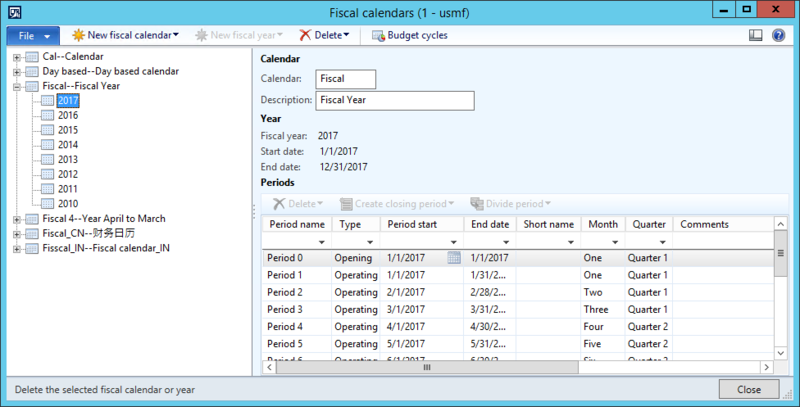 In the Fiscal calendar field you can select the new created calendar. When you save this record, you will get a warning stating you should recalculate ledger periods. This process will replace references to the ledger calendar per accounting entry. Note that when you have a large number of accounting entries for this legal entity, the job might take some time. On the Ledger form you can click the button Recalculate ledger periods. Optional: You can enable the Batch processing to have the process run on the batch server. This is recommended for performance reasons. Using the button Recurrence you can choose a start date and time. Click OK to start the process directly or create the batch task. When you start the process on the client you will receive a warning. When you have new or changed closing periods you might need to review the entries. When the process is executed the steps are complete. Further steps like recalculate balances is not required. 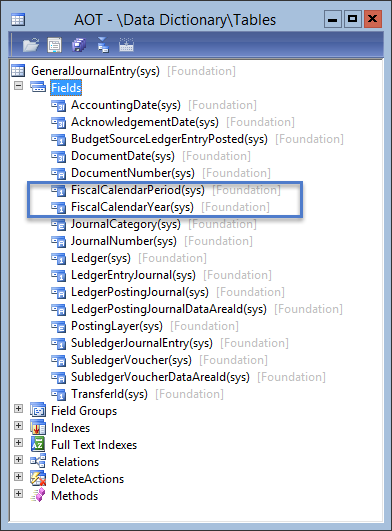 The Recalculate ledger balances process will update the contents of the fields FiscalCalendarPeriod and FiscalCalendarYear in the table GeneralJournalEntry for the records belonging to the current Ledger. Based on the accounting date and old values, new references for the new fiscal calendar will be updated. Thanks Andre for the good post. What do you mean by new references for the new fiscal calendar will update , please explain with small example . Thanks for your comment and reading my blog post. Each GeneralJournalEntry record has a reference (record-id) to the fiscal calendar period. The records for a period from several fiscal calendars are different. E.g. December 2015 for fiscal period YearJanDec can have record ID 5622456745. The same month for calendar YearJulJun can have record ID 5622456892. So to be able to represent the correct fiscal period, this job will replace the references for the record IDs from one fiscal period to the period of the new fiscal calendar. It is a reference which is technically. Thank for this excellent post. Could you please guide , what changes required for Fixed Asset Calendar. Thanks for reading my blog. This post was related the ledger fiscal calendar. Can you post your question related to asset calendars on the Dynamics community forum? The link is in the bottom of the blog post. Could this technique be used for a legal entity where the user has mistakenly closed all periods and now needs to post adjustments? So they create a new fiscal calendar, then fiscal year. 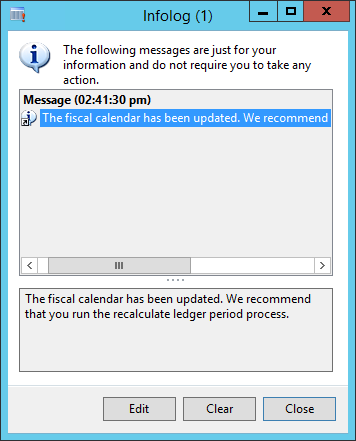 Then link the new fiscal calendar in General ledger > Setup > Ledger and then recalculate ledger periods? This is not the procedure to re-open periods. Once periods are closed, you cannot change them from within the application. It would be possible to update the status field of the periods in SQL directly. Note that this should probably be documented and approved for auditing purposes. But be careful and test this in a separate environment/database first. 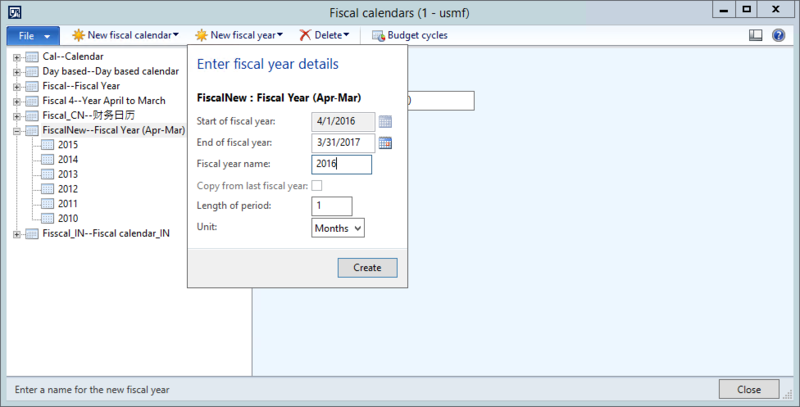 Can I Create Under Fiscal calendar Previous Fiscal Year ? Now I Want Create Fiscal year 2009 and transaction is already done in 2010. 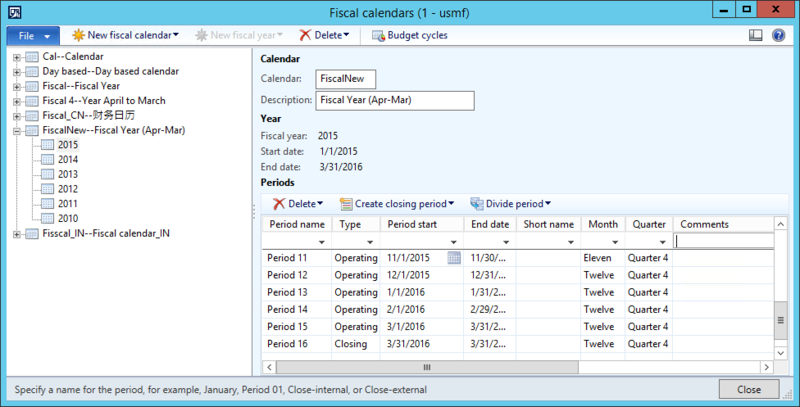 Fiscal Calendar is linked with Fixed Assets. You can try to remove all fiscal years; then insert starting from the year 2009. Test it carefully in a separate environment first. I have created a new financial year for FY2018 and follow the prompt and the name of the Financial Year created is “2018” however, the other years’ names are 1/7/20xx and therefor my format of the name of the year is not consistent. Is there any way I can edit and rename the financial year? First of all, thanks for reading my blog. Functionally, you can only change the name by deleting the years and re-create them. We are currently in a Fiscal Year of Feb 2017 to Jan 30 2018. Our company wants to go to a calendar year for 2018. What would be the best approach? Do we short Fiscal 2017 a month and end it in Dec 31 2017? and start 2018 on Jan 1? What would be the impact to 2017? You have to check with your accountant what would be allowed according to your country. When allowed, you can indeed shorten the fiscal year with one month. If you don’t have transactions in January 2018, there will be no impact. Before doing the change, test it in a separate environment. Thank you for the step-by-step instructions. I can see that GeneralLedgerEntry now points to my new calendar. What is the process for making Management Reporter recognize the new calendar? Thanks for reading the blog. Usually changes are synchronized automatically (every 45-60 seconds). I haven’t tested changing a calendar in combination with Management reporter. If changes aren’t recognized, you can check if the synchronization is running and not raise any errors. If not, you could configure a new data-mart database in the end. Thank you for blog. Do you have any references for this process in AX 2009. My company wants to change from a 31 March FY to a 31 Dec FY. 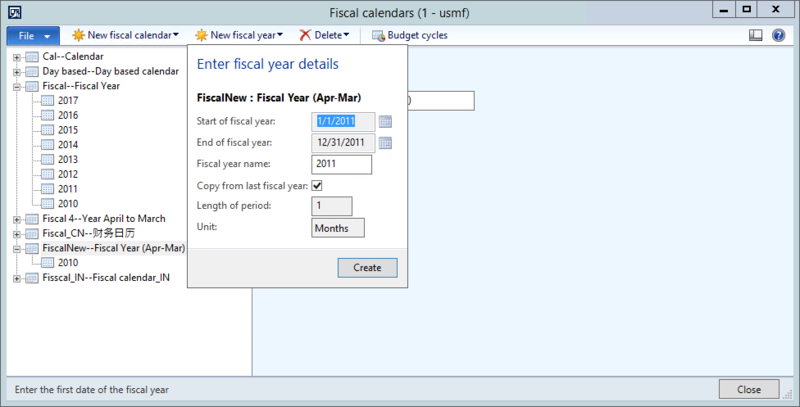 You can edit the periods manually on the form Fiscal Calendars. How do we change the calendar on Value model on a fixed asset which has transactions already posted. When I try to change error message ‘Cannot change the calendar, transaction already exists’. As the error is stating, it is not possible to change the calendar once transactions were created. When required, you can change the number of periods for depreciation. Please suggest me if I created Fiscal year (Jan-Dec) 2016, 2017,2018 respectively under fiscal year Calendar and fiscal year is closed 2016 and 2017 . Now i want to check before closed 2018 merged 2017 and 2018 Trial balance or Dimension statement reports for balance checking purpose . Step -1 if i create new Fiscal calendar and create fiscal year 2017 and 2018 . 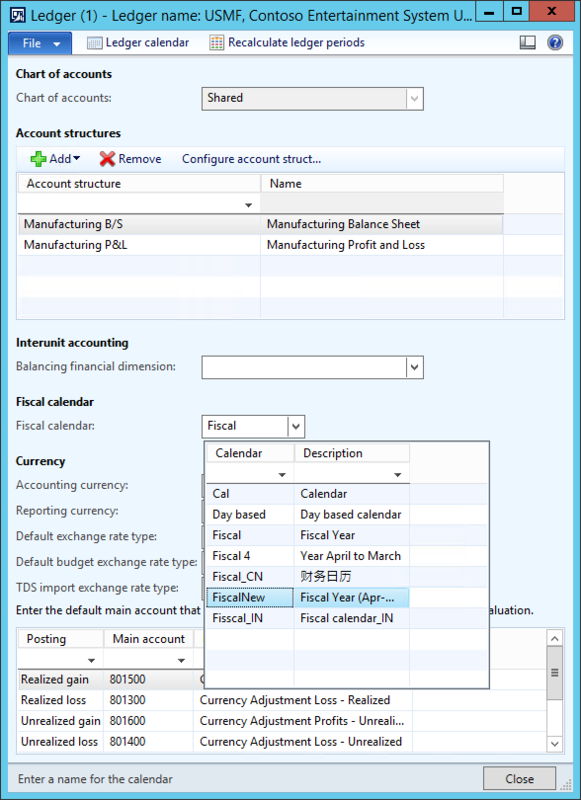 Step 2- Assign General Ledger — Setup – Ledger and assign new fiscal Calendar . Can we do without any functionality effect ? To be honest, I cannot understand what you are asking here. Can you submit a question on the Dynamics community with some additional information/examples?